I have a fault on my K1200LT 2007 bike. The warning triangle lamp is on and the brake failure lamp flashes once a second when I turn on the ignition. I can also hear the ABS pump running. I've searched the internet for advice but it is relatively scarce. "17166 Internal control module error - Analogue value, front pressure sensor"
Can anyone please offer any advice on what the error means? I can't find any reference on the web to this error code or possible solutions. I found some good info over on the HEXcode forum (GS-911 guys) by a member called "Jughead". He is in Port Elizabeth and has worked several of these units. 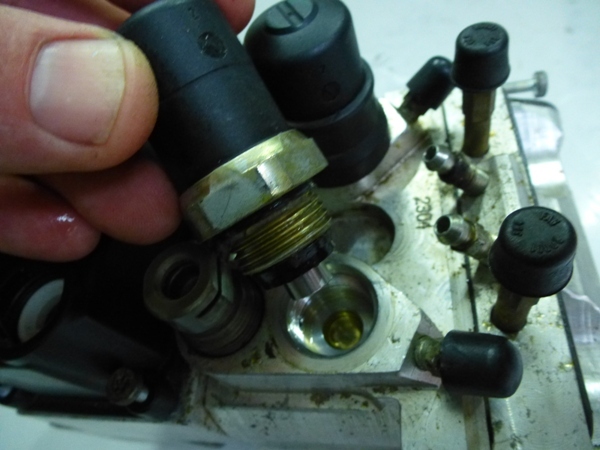 There is a pressure relief valve that you can get to easily and remove and replace with out upsetting the unit. He claims that cleaning these up and making sure the little piston moves has fixed several units. Remove the rubber cover and find a spanner to unscrew it. The front wheel one is the one closest to the battery. It would be worth a try. Just push in on the silver button on the end to make sure it is not stuck. Daft question time but have you driven the bike after turning the ignition on? The warning light flashes on mine until I've moved forwards three or four yards. Good point Keith since it was his second post. But he did indicate a fault read with the GS-911 unit. We will see when he comes back again. Eventually I decided to take the K1200LT to a local repairer in Nottingham who specialises in BMW motorcycles (not a dealership). I had a lengthy discussion with him as he knew all about these ABS units and their unreliability. He had changed many of these units on a range of BMW bikes and costing over £1500 for each repair. He said there was no guarantee that the same failures would not re-occur after spending this obscene amount if money. His professional recommendation was to remove the entire unit and 'normalise' the braking system. This entailed a small pipework and electrical modification to the bike. Obviously you lose the ABS facility and the integrated braking but you do end up with a reliable and good braking system. Obviously I was concerned about braking performance, residual value of the bike with this system bypassed, insurance implications etc. but in the end I decided to have the system removed and normalised. The bike rides great, the new brakes work fine and I am very pleased with the cost of just £235 for the work, including an MOT test - ensuring the brakes are up to regulations and performance. I also have peace of mind that the braking will be reliable as the complexity of the system has been simplified. As for the effect on the re-sale value of my bike if I ever decide to sell it on... well I hope common sense prevails. The bike will be more reliable and future owners will not have the threat of an expensive ABS failure in the back of their minds. I have also kept the ABS control unit that could be potentially repaired and re-installed in the future if the new owner wished to do so. Again, thanks for everyones help and advice and I hope my experiences will help other owners in the same predicament. I was wondering what the outcome was going to be. Enjoy the ride!